Happy Monday pups. Whew, I am beat from this weekend. I had to work extra hard with Dad. 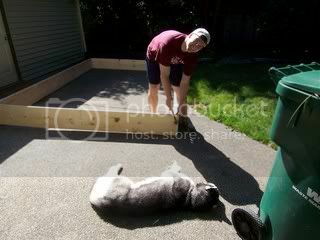 First, Dad and I built this wooden square. As you can see, we were both doing a lot of hard work. We have a lot of pea gravel in our backyard, making paths and stuff. 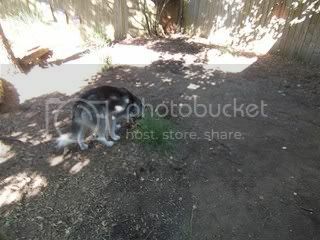 For some reason, Mom and Dad don't like when Kat and I play chase and fling gravel into the grass and everywhere else. So they are scooping it all up to lay flagstones down in some areas and plant grass in other areas. Here's me inspecting where Dad had already removed the gravel. It looks pretty ugly right now, don't you think? Here's what we did with the wooden square. 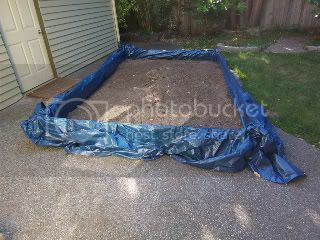 Dad needed a place to dump the gravel until it gets hauled away. 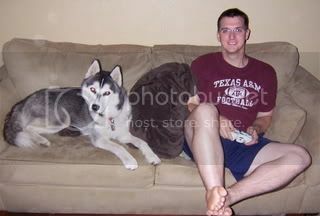 After all the yard work, Dad and I decided to do a little more male bonding and play some Xbox. I'll keep you up-to-date with our progress on the yard. Dad and I still have a lot of gravel to scoop. In our next post, Kat will tell you what the girls of the house did while the men were hard at work building stuff.